I have been a big fan of Chicago since the day I was born here. My family and I spent a lot of time in the city while I was growing up, and now Austin & I are here for the year. I've loved every minute of discovering the good things of Chicago together - and the good food! We've had a lot of fun documenting our favorite places to eat with @ourvieadventures and hope it can be a helpful guide if anyone is planning a visit! Okay, acai bowls are my all time fav. And now Graze is my all time fav place to get one. I worked out and then went to go get an acai bowl and a fresh juice - literally the perfect way to start my day. What to order: acai pt. 2 bowl or the pitaya bowl. Chicago is known for it's deep dish pizza and Giordano's is known for the place to get it. It's our favorite pizza place in all of Chicago, hands down. Bar Siena is an Italian restaurant in Chicago's West Loop neighborhood - if you have the opportunity to explore this area and visit Bar Siena, don't pass it up. Each of Bar Siena's menu items are intended to be shared - which makes for a good all-around experience when you get to try it all! What to order: roasted meatballs, carne pizza, sweet corn ravioli, meatball calzone. I should probably just list the whole menu here. This. Place. Is. So. Cute. I really don't need to say anymore than that. I guess I should include how yummy the food was too. Don't miss it. What to order: I would just get one of everything. haha! But really. The santa monica turkey sandwich and the huevos rancheros tostadas were both amazing. Kanela is one of our favorite breakfast places in Chicago and the Streeterville location is SO cute. We went on a rainy day in the city, and it couldn't have been a better hide out. What to order: potato pancakes and the crunchy french toast. Portillos is another one of my family's favorites. 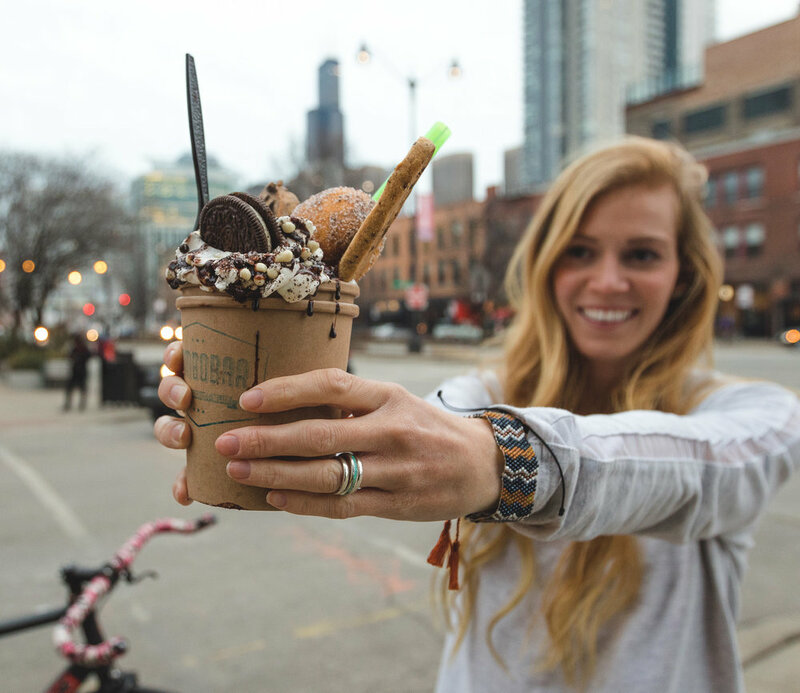 They are famous for their Chicago hot dogs and chocolate cake shakes! I've been eyeing Yolk for a while, so I was really excited to visit! Yolk is a fun urban breakfast & lunch restaurant with fresh and cheerful vibes - lots of bright colors, happy faces and delicious food. What to order: very berry french toast or the countryside breakfast skillet. Guys, honeygrow. They have delicious stir-frys, salads and honeybars (yogurt, fruit, honey & toppings). The honeybars are AMAZING and so refreshing. You know how sometimes you leave a restaurant and feel like you overdid it? Our bellies were full, but we felt good because we put all good things into our bodies! What to order: spicy garlic stir fry & any of the honeybars! Cafe El Tapatio was a hidden gem in the middle of two of my favorite neighborhoods, Southport and Lake View. If you are down for exploring some of the Chicago neighborhoods, then these can't be missed. 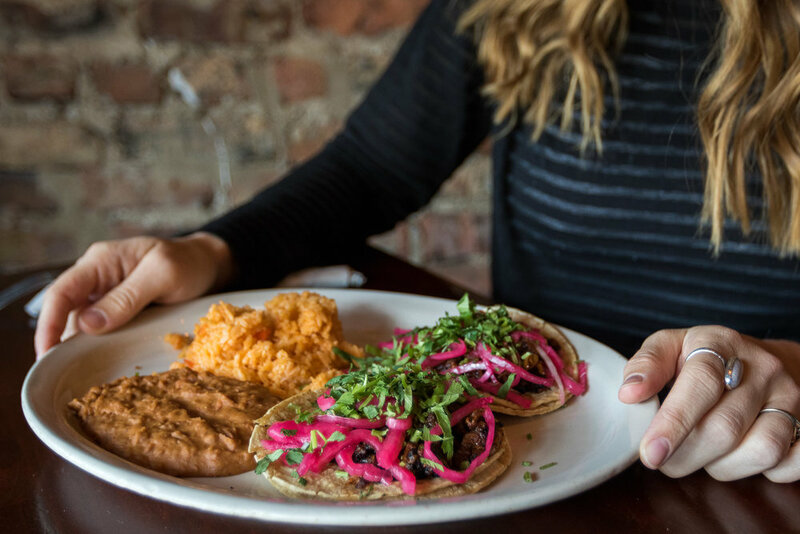 With brick walls, cafe lights, and Spanish tile floors, the Hispanic ambiance can't be beat. And the food. It can't be beat either. What to order: verdes enchiladas, camarones juanita (named after one of the cooks) & a guava ice lemonade. I'm going to be 100% honest. I'm not the biggest fan of fish, so I felt like I was being a realllllly good wife and mama to take Austin and Addison here. And I'm so glad we went! The restaurant is owned by all women - GIRL POWER! There is something for everyone - even if you don't like seafood. Austin said he won't ever settle for anything less. 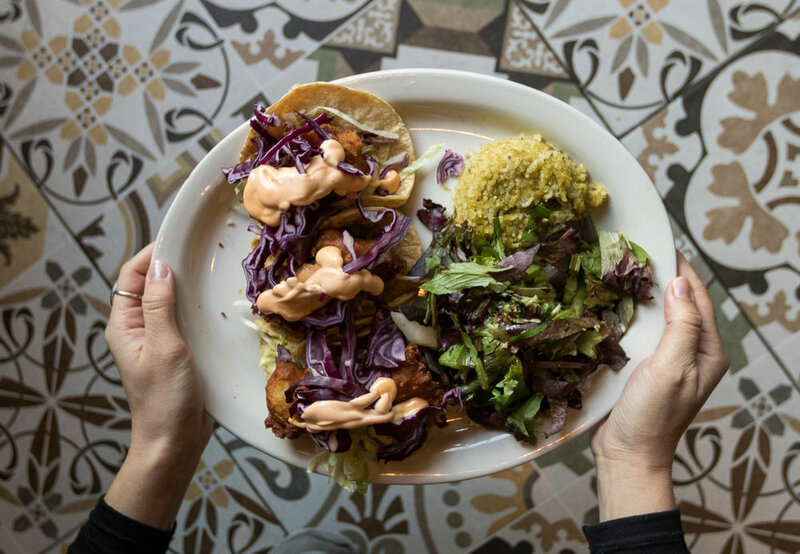 What to order: grilled whitefish salad or the cod & tots (and a sprinkled ice cream cone, of course). Bombo bar was just that - bomb. Doughnuts AND gelato, can it get any better? As a bonus, it is probably the most instagramable food I've ever had, so you can make all your friends a little jealous! ha! Be warned - this place is for the sweetest of sweet tooths. What to order: s'mores hotter chocolate and toasted coconut gelato with a nutella doughnut. But seriously, when it comes to doughnuts and gelato, can you even go wrong? Eggs feels like a cozy old-school breakfast place with a hip modern twist being right in the city. This place knows how to goes all out, but they also have healthy options if you want to start your day with something a little lighter. What to order: skirt steak skillet, lemon blueberry pancakes, very berry healthy multigrain pancakes and a cup of freshly-squeezed orange juice. We went here for brunch and it had to be one of our favorite restaurants that we've visited in all of Chicago. Sociale's chef has serious talent - not only does it look amazing, but every bite tastes amazing too. I love french toast, and after eating the almond crusted french toast here, my expectations are never going to be the same. Don't miss this place. What to order: almond crusted french toast, grilled steak & eggs, or the lemon blueberry pancakes. When you get that craving for a burger and fries, this is the place to go. The place was filled with Chicagoans - they know where its at and I'm spilling the beans. Such fun vibes, delicious food, amazing staff, overall we had a great time and will be visiting again. What to order: fried pickles (I don't even like pickles and I liked these), wild bill burger, back-yard classic and top it all off with a banana nutella shake (you're going to be pretty full, but at least a shake just fills the gaps). Meli Cafe is known for their brunch scene. One thing I loved about Meli Cafe is that everything was homemade - the jams, breads and even the butter. This cafe is Austin's favorite place to get breakfast in all of Chicago. What to order: down on the farm breakfast bowl, breakfast quesadilla, or the granola pancakes. If you have a little kiddo with you, let them splurge and get the chocolate chip pancakes...our pancake queen was in heaven! I felt a little bit like we were in the movies going to this restaurant - it's just as dreamy on in the inside as it is on the outside: the candlelight dinner, the fancy looking servers, the Italian music in the background, the homemade pastas. When you're feeling like going all out on your Italian dinner night, this would be a great place to go! 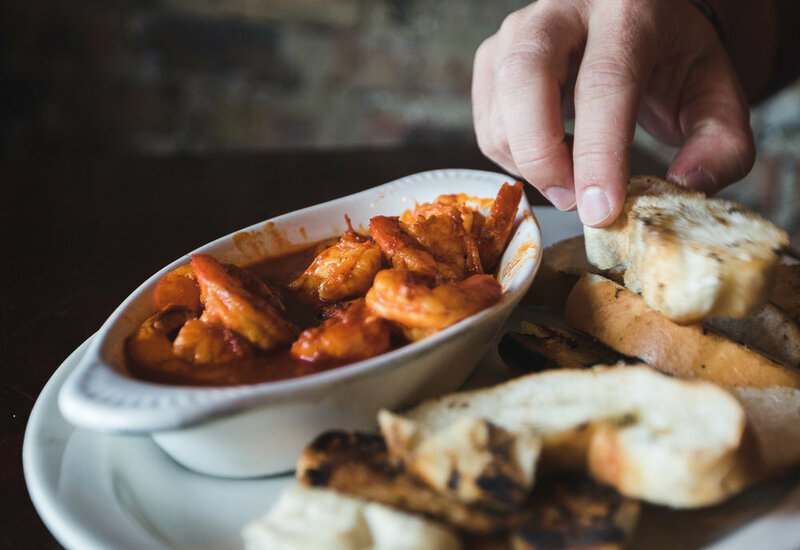 What to order: bruschetta, spicy calamari, 8 finger cavatelli arrabiata, or stick with the classic spaghetti and meatballs because they are absolutely incredible. There was a year in my life where I didn't eat meat and I think I made up for that year in one night. Texas de Brazil was a one-of-a-kind experience for us. This Brazilian steakhouse has a gourmet buffet, as well as servers who would carve meat for us at our table. When we turned our place card to green, we were swarmed with carvers serving every kind of meat you can think of (garlic sirloin and BBQ brisket were my favorites!) What to order: Everyone here pays a flat price and has access to the buffet as well as the meat - it was fun for us to try a little bit of everything. The strawberry lemonade was divine and we topped off the meal by sharing a strawberries and cream shake and a key lime pie. Corner Bakery is one of our family's favorites! It was always our go-to whenever we were in Chicago. We love Corner Bakery - if you haven't been, stop by for a breakfast or lunch! What to order: chicken pesto sandwich, meatball panini, spinach sweet crisp salad and a lemon bar or a chocolate baby bundt cake. Garretts is a must in Chicago, and don't even worry about looking up the location on your phone - the delicious gourmet caramel popcorn smell and the lines down the street will lead you right to where you need to be. They make it fresh every day! What to order: the chicago mix - cheddar cheese and sweet caramel mix. I know, the cheese part sounds a little funky, but it is the perfect mix of sweet and salty! This place is right by our apartment, so we were excited to go try it out. It didn't disappoint! What to order: combo beef and sausage sandwich or the strawberry spinach avocado salad. Mar 8 Chicago Girls Weekend!